1. If the octopus is fresh, rinse it well and scour it. If it is frozen, let it outside to cool in room temperature. Slice it in pieces and put it in the pot in a pre- heated oven of 180°C. 2. Scour the onions. In a non stick pan, add some olive oil, the onions, mix and saute until the onions get golden. 3. 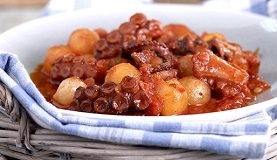 When the octopus gets softer and is pinched with a fork, we add the wine, the vinegar, the orange juice, the rosemary, the onions, the olive oil, the orange peel and of course salt and pepper. 4. Try it at least after one hour! Enjoy!